Trams being separated from road traffic? Left hand running on double track? Orange LEDs in the destination boards? Passengers boarding from platform stops? Track laid with concrete sleepers? Overhead wiring supported by poles between the tracks? Pantographs for current pickup? Check, check and check! I’m actually being a bit sneaky, as the Melbourne photo isn’t exactly representative of the rest of the network. Whatcha gonna do about it? Let’s not forget about the trams themselves: the ones seen here look to have a family resemblance. So let us take a closer look: the first photo is from Melbourne, while the second is from Hong Kong. So who is this “Comeng” mob anyway? Originally known as Commonwealth Engineering, they were an Australian engineering firm that designed and built a wide variety of locomotives, trams, carriages and railcars for both the local and export markets until 1990, when they became part of the multinational company ABB Transportation. Later known as Adtranz, the company still operates in Australia as part of Bombardier Transportation. The Melbourne tram pictured above is a member of the Z3 class, with a total of 115 trams being built between 1979 to 1984 by Comeng at their plant in Dandenong, Victoria. These trams were an improved version of the 120 Z1 and Z2 class trams built by the same company between 1975 and 1979, the Z class family was Melbourne’s first “modern image” trams, and marked the turnaround of the tramway network in the city, which had not seen any new trams built for twenty years. As for the Hong Kong tram, #1044 is a Phase I LRV built by Comeng at the same Dandenong factory as the Melbourne tram. A total of 70 trams were delivered in 1988 as part of the initial fleet ordered to operate the Light Rail network, with the design being a blend of two tram classes that operate in Melbourne: the previously mentioned Z class, and the somewhat newer A class delivered between 1984 and 1987. Over the next decade Hong Kong placed two additional orders for vehicles of a very similar design, but these were built by other manufacturers. So what differences are there between the two types of tram? Hong Kong’s Phase I LRV fleet is currently being refurbished by the MTR, with the original Z class style cab being replaced by a new fibreglass fairing as seen on the newer Phase IV LRVs. As a result in a couple years time the Melbourne and Hong Kong Comeng-built trams will look nothing alike. This entry was posted in Transport and tagged Australia, Hong Kong, KCR, Kowloon Canton Railway, light rail, Mass Transit Railway, Melbourne, MTR. Bookmark the permalink. Judging from the seating, it seems that the KCR rolling stock is narrower than similar Melbourne trams, I don’t see why this would be given that the Phase I vehicles, when new, ran on completely new track, why didn’t they make the minimum track centre width as wide as in Melbourne? Step free access has been possible since the beginning because of high platforms on the KCR light rail, possible in all locations where there are stops. The first B class Melbourne tram was originally fitted with dual height entrance steps, suited to both high platform and street level loading. But then these were replaced by fixed low level steps, with low level platforms added to the light rail lines. But high platforms won’t fit in most locations on Melbourne’s tramway network. The platforms at San Hui (pictured above) would not fit here. 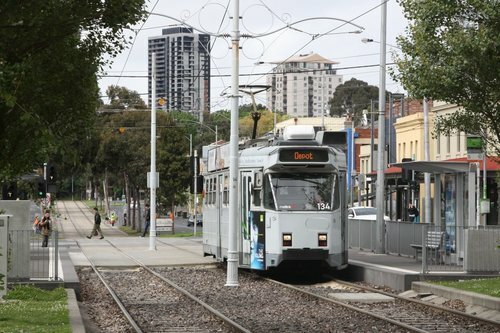 That picture shows a low floor tram, these are becoming more common across the network and high floor trams, these no longer meeting the criteria for a new Melbourne tram, are being retired. Though the KCR LRVs still appear to meet these criteria thanks to high platform loading, and in light of this I wonder if they will remain in service, being rebuilt, long after Melbourne trams of similar age are withdrawn. Look at how long our W class trams have lasted. Surely newer trams/LRVs could be kept going for that long by being periodically rebuilt as long as they still meet the minimum criteria. In the comparison, the driver’s cabs have been compared, what about cab controls. All our Comeng trams have (road vehicle style) foot controls in addition to a non-temporal deadman’s pedal. That is, holding the pedal continuously is sufficent to keep the emergancy brake disangaged. Here in Melbourne, but not necessarily in other cities with trams (newbuild or legacy), non-temporal deadman’s controls are going the way of high floors, within the same timeframe. All of our low floor trams require a physical response to keep the emergancy brake off, though the Combinos did orginally have non-temporal deadman equipment too. Comeng was part of the Australia consortium involved with building the KCR Light Rail system in Hong Kong in the late-1980s. The book ‘Comeng: A History of Commonwealth Engineering Volume 5, 1985-2012, Volume 5’ includes many artists impressions showing proposed light rail vehicles for the network – most of them based on Melbourne trams of the same period. Those proposals did include an articulated B class-style vehicle, but the decision to use the same constrained track centres and curve radii on a greenfield network is an interesting one. 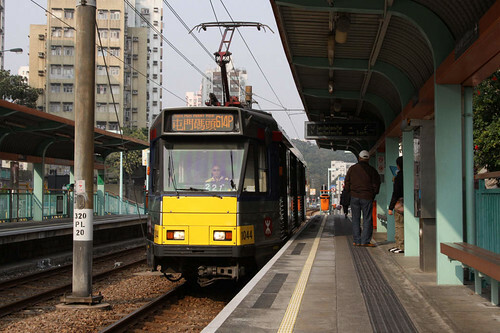 As for how long the Phase I LRVs will stay in service in Hong Kong, it took 15 years for until a mid life refurbishment program was commenced. For the purposes of comparison, Hong Kong’s original Metro Cammell EMU fleets are still in service today, having entered MTR service back in 1976, albeit with a mid life refurbishment. As for the controls onboard Hong Kong’s light rail vehicles, it appears they are using Melbourne-style foot controls. I’m unsure as to whether the newest Phase IV LRVs still use foot controls, or if they have switched to European-style controls. I saw the photos and the first one does show a lever to the left, which looks like a master controller. I wonder how the Metro Cammel fleet compares technologically with the Hitachi trains in Melbourne which were built the same decade. Metro Cammel did build LRVs for the Tyne and Wear metro back in 1980, also suited to high platform loading. 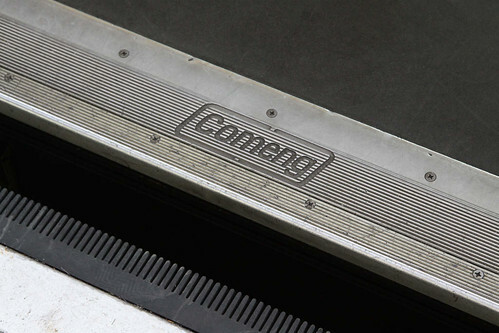 Comeng pioneered the double decker EMU and proposed a low floor tram back in 1982 and made chopper controlled trams as early as 1979, yet still made trains with camshaft controllers as late and the early 1980s. Thanks for that pickup – on second look I can see the master controller on the console. Although the Melbourne trams load from ground level they curiously require a big step up into them. Also I think there were plans for both ground and platform level loading in Melbourne eg B class trams on the St Kilda line. Was some experiment made with a Z class? In the end the steps were removed, and low level platforms were provided on the converted light rail lines. And with very few exceptions (such as the tram stop in Brunswick between Royal Parade and Sydney road) these stops were the first platform stops in Melbourne. I’m not sure the official reason it was abandoned, but I do know there aren’t that many other locations on our tramway network where platforms higher than, say, 400mm TOR would work. I also know that all trams and stops need to be accesible by 2032 and the DDA specifies a step height of no more that 12mm. And the typical structural stetup of a modern tram does not allow for a foor height less than 350mm TOR. Those who read correctly will realise that kneeling suspension is not an option, and this is because of the mechanical limitations of rail vehicles. So we need low floor trams to meet this requirement, but that’s not all. So, if the mininum floor height is 350mm TOR, that is also still the minimum possible step height at most of our tram stops, slightly higher than the kerbs on the roadsides. Although both of our first two type of low floor tram do have on board ramps, I don’t think they are long enough to get wheelchairs over such a high step, let alone over the gutter on the sides of four lane roads, yet I also believe they are still too long for our safety zones. So for all intents and purposes, anyone reading this will be forced to conclude that low floor trams with platforms sightly higher that the footpath are the only solution for us. The KCR were lucky to be able avoid the problem that low floor trams were designed to solve, having room in all locations to make their plaforms heigher than the wheel tops. *The LRV bogies are evidently conventional railway type ones. *Electrical control equipment is located under the floor, not on the roof. *No podiums or wheelboxes and thus greater interior design freedom. BTW very interesting blog it makes me want to go to Hong Kong.